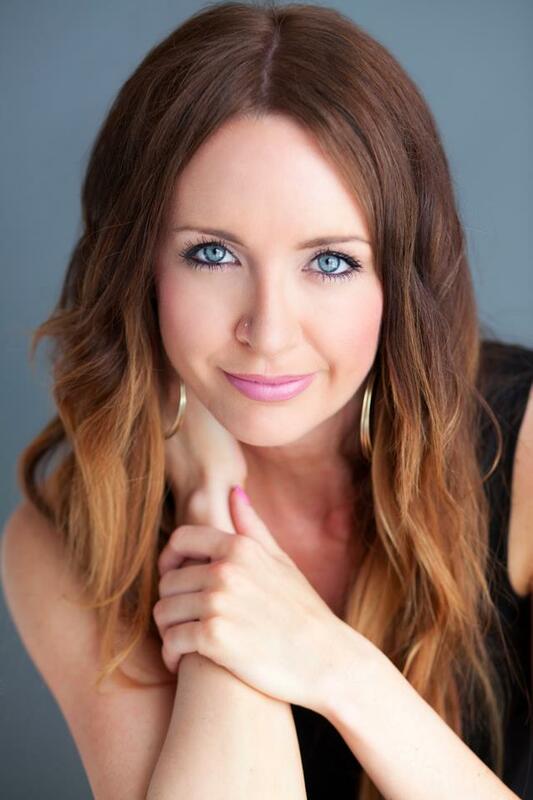 We are introducing a fantastic new contributor this month, make-up artist, Lauren Graves. Lauren has been in the industry for five years and is here to teach us everything we must know before making a foundation purchase at the make-up counter of choice. Alright ladies! Spring is upon us and summer is quickly approaching. This means we will all be out in the bright beautiful sun, soaking in that Vitamin D...and showing off our gorgeous skin! And that is just what we are talking about today. Your skin! Specifically the skin on your face. That is, after all, the first thing everyone sees when they look at you. While we all try to get our bodies ready for summer I'm here to remind you, let's not forget about our face. First things first, let's talk about your skin's "type". You really should know your skin type. I have worked in the cosmetics/skin care industry for more than 5 years and what I find often is that my clients "think" they know their skin type. But often they don't. I'll have someone tell me that they have oily skin and after asking a few questions I'll find out that they just sweat a lot. This is not the same as oily skin. Or someone else might come to me and say they have very dry skin and really it's just the product they are using that is drying them out. A good test is to look at your skin right after you've washed it and few hours afterwards. If you feel dry, itchy, tight or a burning sensation right after you wash your face, you may be dry. But you may also be combination. You'll know when you look at your skin a few hours later. If you see shine in the T-zone area, combination skin it is. Now if you wake up shiny, rarely feel the need to moisturize, and see shine from hairline to jawline throughout the day, you would be considered an "oily" skin. Knowing your skin's type comes into play when trying to pick out the right foundation (or "base") shade for summer. If you don't tan or spray tan in the summer then you won't need a new foundation, but if you plan on getting color at all in these next few months then it's time for a change. I highly suggest going to a makeup counter and having them match your foundation shade. No one likes an orange face and white neck. You may not think anyone notices but take a look in your rear view mirror on your next drive. The natural sunlight will tell all your secrets....and really it's only a secret to you. Everyone else has probably already noticed it by now. So march yourself right up to a makeup counter or a cosmetic store and ask for professional help in matching your shade. You will be one of two things: a "golden" undertone or a "rosy" undertone. These are nice ways of saying yellow and pink. You may not see it yourself but everyone has one of these two colors in the undertone of their skin. Nothing makes me cringe more than seeing someone in a foundation of the wrong undertone. Here's a tip, it should blend in perfectly to your jawline and neck. You shouldn't see an obvious line where the natural skin stops and the makeup begins. Once you have your shade and undertone sorted out, it's time to decide how much makeup you are willing to wear. How much skin do you want to see through your foundation? None? Then you are looking for a "full" coverage foundation. Some skin? That would be a "medium" coverage. Do you want to see mostly natural skin? You would need a "sheer" coverage foundation. So now you know 3 important things: your skin's type, your skin's shade/undertone, and how much coverage you want out of your foundation. It's finally time to pick one out! There are so many foundations to choose from. Don't feel overwhelmed. You have the tools you need now to use process of elimination and narrow your choices down to just a few. Now since I work mostly with MAC Cosmetics and absolutely love their products I will give examples from their line. For a full coverage foundation you have a few choices: Studio Fix Powder or Liquid foundation has a natural matte finish and is great at helping to control oil on the skin. There is also a great foundation called Pro-longwear. This is perfect for those of you constantly on the go. Athletes, doctors, and busy moms will all love this this one. It stays on all day and I mean ALL day. It helps prevent the breakthrough of oil and sweat in your makeup. If you are the least bit dry though, this foundation may not be for you. So for you truly oily types, give these a try. If you have a dry skin, find your way to the Mineralize foundation at MAC. Really any mineral makeup is great for a dry skin. The makeup contains all natural emollients that keep you hydrated and give you a natural glow. This foundation is usually more sheer but can be built upon to create a more medium coverage. Also try one of my absolute favorites, Studio Sculpt foundation. It gives a "natural skin"finish that looks totally flawless with a medium to full coverage. Combination skin types have a few more choices. You can really go with almost any foundation. There are two that are more "middle of the road" foundations that look amazing on the skin but won't make you more dry or more oily. 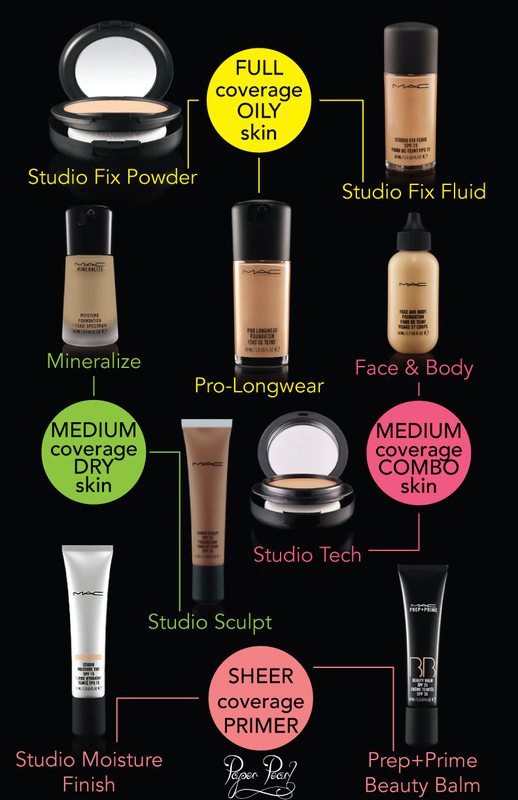 Studio Tech foundation is a medium, buildable coverage cream foundation that gives a natural matte finish. I personally love to use a wet brush to apply it. Face and Body foundation uses a blend of emollients to create a natural satin finish and is also water resistant. (Great for beach and pool!) It has a sheer to medium coverage. Now since we started out talking about summer I can't forget to tell you about Studio Moisture Tint and Prep + Prime Beauty Balm. Studio Moisture Finish is a tinted moisturizer that has a very sheer coverage but just enough to even out skin tone. Prep+ Prime Beauty Balm is very lightly tinted and also doubles as a primer and your daily SPF of 35. Both of these I've mentioned give a very natural finish and are also perfect for being at the beach or pool. MAC has a a foundation for anyone and everyone. I only mentioned my favorites here but if you can't find what you are looking for in that short list, any MAC artist would love to assist you in finding the perfect fit for you. And of course there are many other great makeup lines out there that I know you would love. Whatever you choose, I do want to stress the importance of going to see a beauty professional. On your next trip to the mall stop by a cosmetic counter and I'm sure they would love to help you find the perfect and most natural shade for you. It sure does beat buying the wrong shade at the drug store and having to return it the next day or finding out you have that oh so dreaded "line of demarcation" right around the jaw line. I've really loved sharing my beauty tips with you all today and hope to do it again soon! Have fun in the sun ladies! Stay safe and don't forget that SPF! Lauren Graves is a seasoned makeup artist from Nashville, TN. Growing up in Nashville she started pursuing the arts from a young age. From drawing, painting, writing and acting Lauren has always had a love for all things creative. About five years ago she realized a blossoming love for makeup artistry when she became friends with a someone in the field who taught Lauren the basics. With a previous artistic background, an eye for color and a desire to make others feel and look their best, makeup came naturally. She started working for M.A.C. Cosmetics in Nashville but eventually transferred to a larger location at 3rd Street Promenade in Santa Monica California. There she had the opportunity work some of M.A.C. 's largest events nationwide, work with celebrities and even join a team of makeup artists for a Fendi runway show in Beverly Hills. Lauren has since moved back to Nashville for the time being and is in the process of getting her Esthetics License so she can further her knowledge of skin care. She still continues to freelance for local weddings and photoshoots.